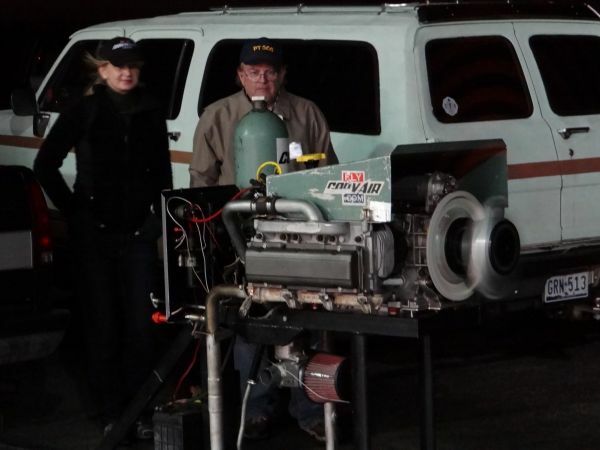 One of the things that we have been testing lately is a mechanical fuel injection system from Precision, makers of certified aircraft fuel systems. Precision has developed a single point fuel injection system that is entirely mechanical for engines in the Corvair’s power category. We have had one of these for several months and conducted a number of tests. Below is a quick outline of some of the data we’re collecting. 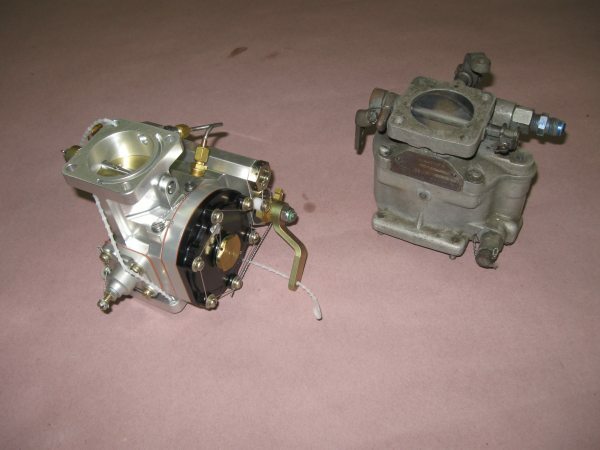 Above on the left is the Precision fuel injector, on the right for size comparison is an MA3-SPA Marvel Schebler carburetor, the most popular Corvair carburetor. The Precision injector is designed to fit in exactly the same space with the same bolt pattern as an MA3. Just for starters, let me say that many people do not understand the function of mechanical fuel injectors on aircraft. The above unit is closely related to the operation of an RSA fuel injection system, the gold standard of mechanical fuel injectors. 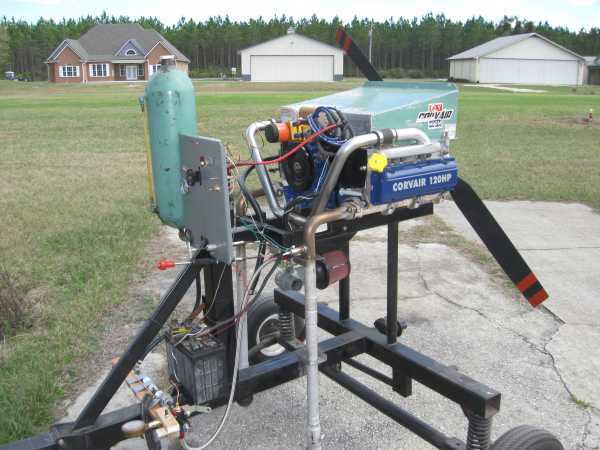 Part of what confuses experimental aircraft builders is the fact that there are a number of carburetors that include in their name the misnomer “throttle body injector” or “Aero injector.” Both the Ellison and the Aerocarb are useful carburetors but in no way shape or form are they fuel injectors. They are simply flat slide carburetors that do not have float bowls. The defining characteristic differentiating a mechanical fuel injection system and any other type of carburetor is simply that the mechanical fuel injector meters off density, not off volume. Anything that meters fuel off the volume of air flow that comes through the throttle is a carburetor. Such systems will always change their air/fuel ratio as the density of air changes. Conversely, mechanical fuel injectors, such as the Precision unit, meter off density. When they are set to a specific air fuel ratio they hold it, no matter what altitude you climb to, nor how the conditions change. If you look closely, there are four chambers on the diaphragm of the Precision unit. These four chambers allow this to function as a very precise pressure regulator and metering device based on the mass flow of the air passing through the assembly. 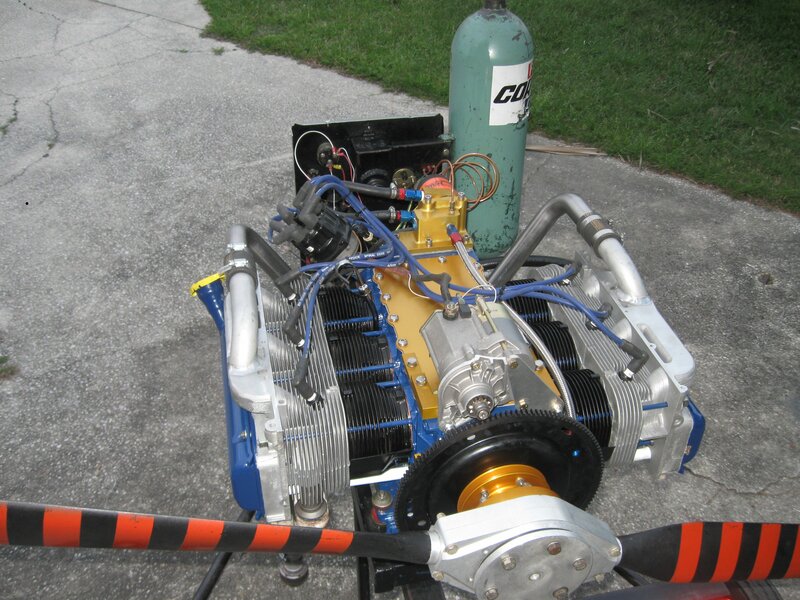 To give you some idea of the quality of this unit, and its adaptability to different airframes, the directions actually spell out that it can be run on any fuel pressure unregulated between 20 and 80 PSI, and it will handle momentary over pressures to 180 PSI without damage. Because of the diaphragm assembly, the pressure can actually fluctuate between any of these pressures and it will not change the air/fuel ratio. 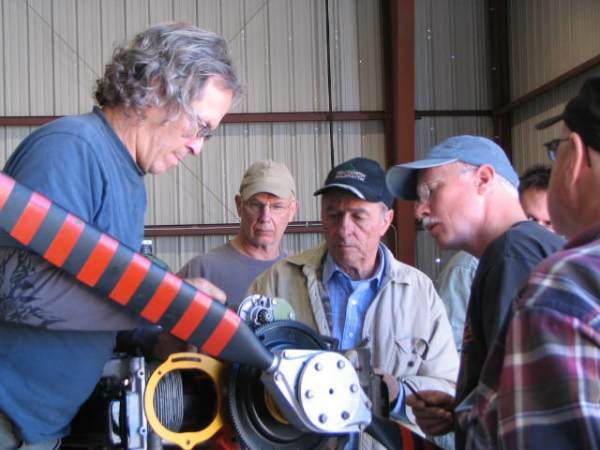 The primary difference between the Precision system, and typical certified aircraft systems, is that this is a single point injector that does not have injector nozzles in the intake ports. It has one nozzle that is in the body of the unit after the throttle plate. This unit is immune to carburetor icing. Yet in operation the fact that the fuel is vaporizing 18 inches upstream of the intake ports allows a very significant evaporative cooling effect. 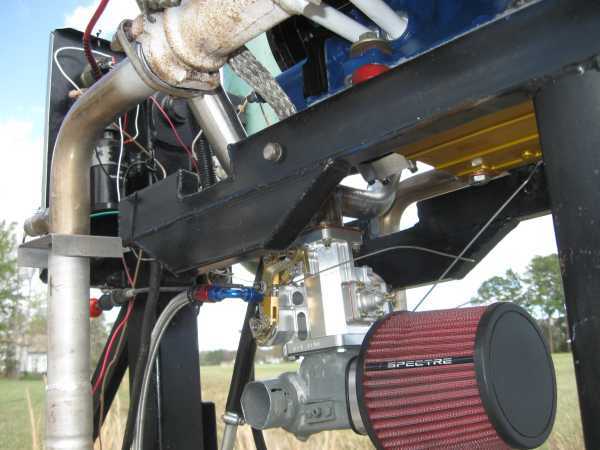 Unique to this unit is the fact that it is equipped with a very potent accelerator pump that gives it instantaneous throttle response that one associates with port fuel injection. Above, the Precision injector mounted on a 3,000 cc Corvair on our engine test stand. Bolting on the injector in the place of our typical MA3 only took 30 minutes. Even the throttle arms are in the same location. As far as I know, this is the first mechanical fuel injection system that has ever been used on a Corvair engine turning a propeller. The system is not cheap. Its suggested retail price is more than $2500. If you are building a Pietenpol and were planning on using a Stromberg, you’re probably not going to change plans and pick up one of these injectors. However let’s look at this from a different perspective. People who are spending $18,000-$20,000 to buy a Rotax 912 or a Jabaru 3300 will find that their engines are equipped with one or two Bing motorcycle carburetors. Although these carburetors are allegedly altitude compensating, in practice they are far from it. 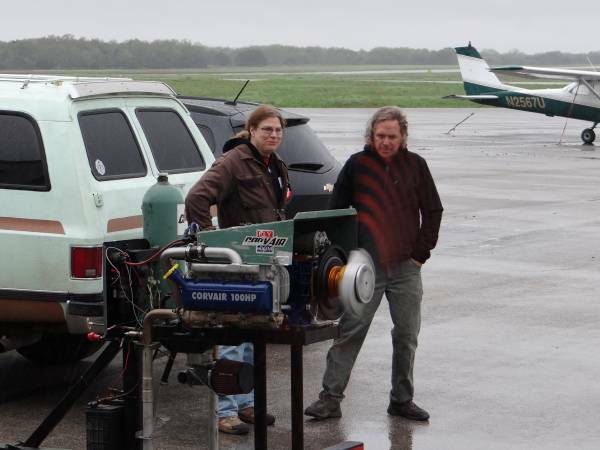 You can ask any operator of a Jabiru engine and they will tell you that at high power settings and high altitudes, their engines are very thirsty, and they have no way to compensate for this. These expensive buy-it-a-box engines come with Bing carburetors because they are cheap. Now let’s look at the 3 L Corvair engine with the injector above. It is the most expensive Corvair powerplant I have built in the past couple of years; the price of the engine complete without the fuel injection on it is $11,500. 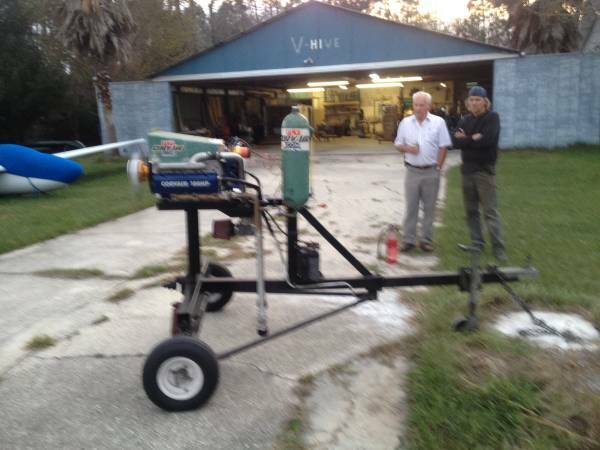 At $14,000, it is $4000-$6000 less expensive than imported engines fed by motorcycle carburetors. Combine this with the Corvair’s made in America pedigree, and its reputation as tough as nails, and many people find that it’s a choice they’re interested in. Corvairs are not for everybody. Most people don’t actually care where their products are made, or if they will be serviceable in five years. It’s a free world and those people can find engines that suit their needs. For people with different value systems, I am glad to conduct R&D to find out what is a real value in high-end engines. Above, the engine runs on the stand in front of our hangar. The fuel line leads down to a rack of instrumentation, a high-pressure pump, and an external pressure regulator used for testing purposes. 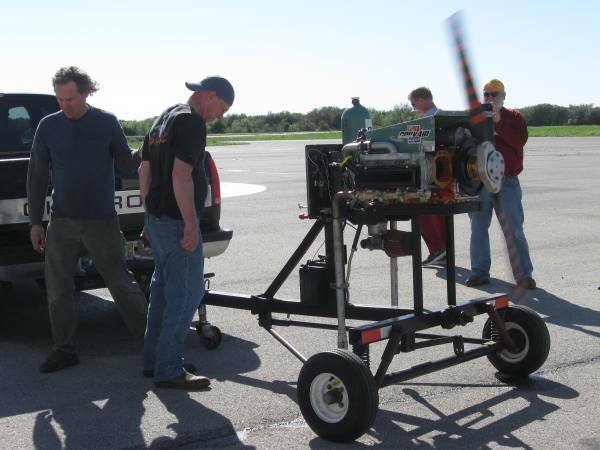 The engine ran very smoothly, and passed our early tests. I will have the unit on display and more information in our NO34 booth outside Building C at Sun N Fun all week. 2012 will be my 24th consecutive year at Sun N Fun. 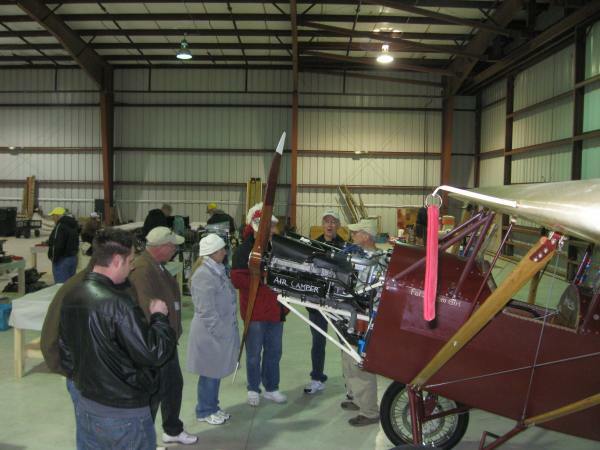 The aviation event has long been known as an exchange point of information and parts for homebuilders. 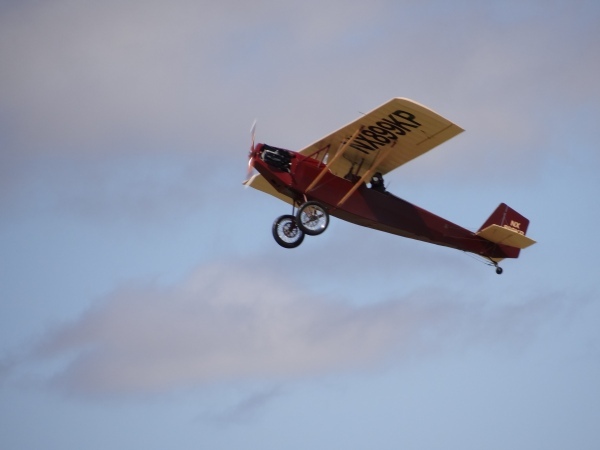 Long before it evolved into the major air show with many different facets that it is today, Sun N Fun was built around a core group of homebuilders, ultralight people, and antique aircraft fans. The air show has always devoted a lot of space and effort to education. The workshops and forum areas have always been given a high priority, even as the air show has evolved to a more commercial setting. For the past 17 years I have given forums on Corvair engines at Sun N Fun. Over the years these have evolved from being delivered in the Contact! magazine engine forum tent, to now being delivered in the three-story Education Center. Over the past 24 years I’ve watched Sun N Fun evolve and change in many different ways. At any major air show it is very easy to point out elements of it that don’t appeal to you. But you should never allow the fact that corporate jets are also there deter you from attending an air show where you have a really good chance to learn a lot of information, make new friends and make progress on your own homebuilt project. For all the other changes at Sun N Fun, it still offers an excellent opportunity for homebuilders, and particularly Corvair fans, to cover these three points. As we have done in previous years we have our own commercial booth at Sun N Fun, NO-34, located on the runway side of Building C. If you’re not familiar with the location, it doesn’t matter as you can always look it up in the official program under FlyCorvair.com. 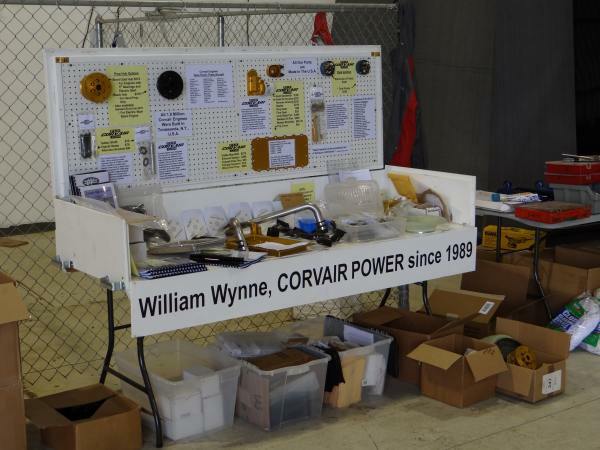 We will be manning this booth every day of the air show and I will be on hand to answer any question Corvair builders have. We will have many new items on display and be able to cover technical questions with all the hardware at hand. As with every other air show we attend, we will have a full complement of the parts that are in our regular catalog. If there is anything special you would like to pick up, please e-mail us in advance and we will put your name on it and you can get it while you’re there. 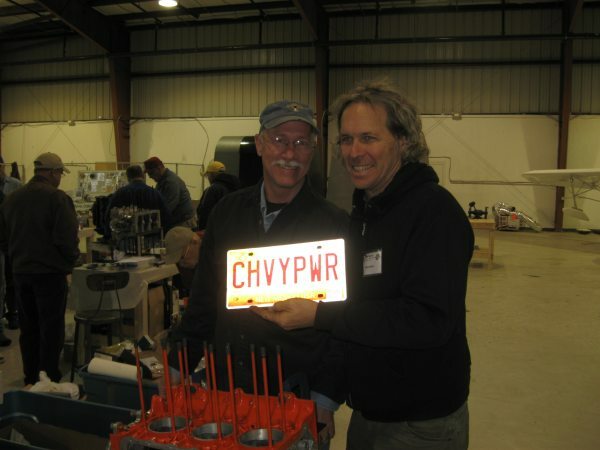 One of the featured items that we are bringing in quantity this year are our Electronic/Points Distributors; we will have plenty of them for sale and I will be giving specific pointers on their installation and timing in Corvair engines. If you’d like to pick one up at the show, they’re an easy item to take home with you. 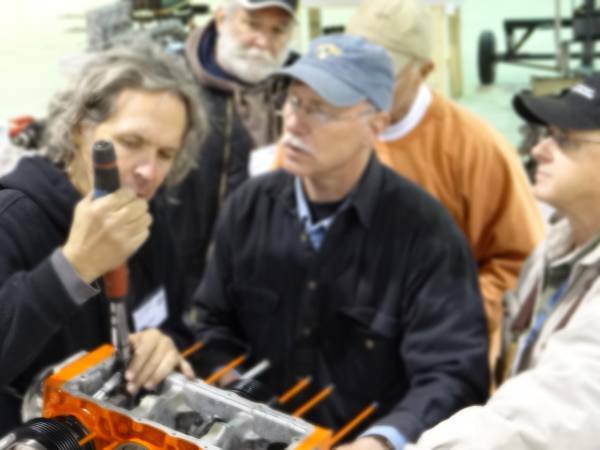 As we always do, we will be glad to inspect any builder’s engine component that he brings to the show. Often it’s something simple that you can carry in and let us get a look at. 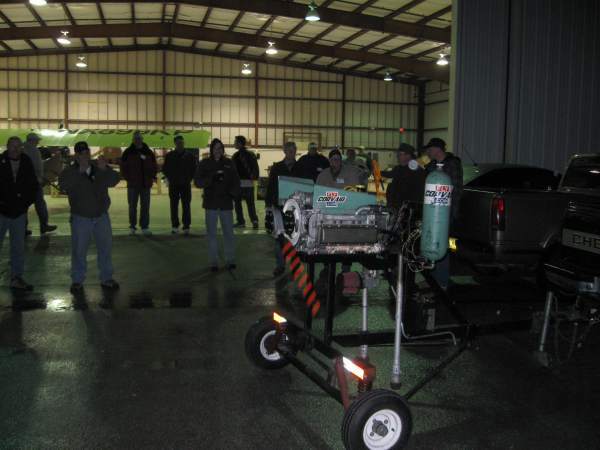 Other times, we will be glad to walk out to your pickup truck in the parking lot after hours and get a good look at a core motor, a pair of heads, anything you care to bring. As many people know, we are planning on having Corvair College #23 in Florida the second week in June. We will have more details on this College at Sun N Fun. CC #23 is going to be marked by an enormous amount of hard-core engine building. If you’re planning on attending #23, I highly encourage you to bring every part you can with you to Sun N Fun to allow us to pre-inspect it and come up with a personal game plan for you to make as much progress as possible at the upcoming College. We are going to run a large group of crankshafts through the nitriding and grinding process before the College. If you would like to get in on this, bring your crank along to Sun N Fun. Additionally, we are going to get a lot of case prep work done beforehand, so builders arriving at #23 will have everything lined up to jump right into assembly. Although they are separate events, Sun N Fun will be the launchpad for some of the most productive builders at CC #23. 11 a.m. Friday, March 30th, 2012. On the social side, we are jointly hosting the Corvair barbecue with Dan and Rachel Weseman of SPA on Friday evening. Stop by our air show booth anytime during the week and we will get you directions to the exact location where it is being held in the campground. Last year, we had an excellent turnout of people and a grand time and we hope to see many of the same friends and some new ones also. 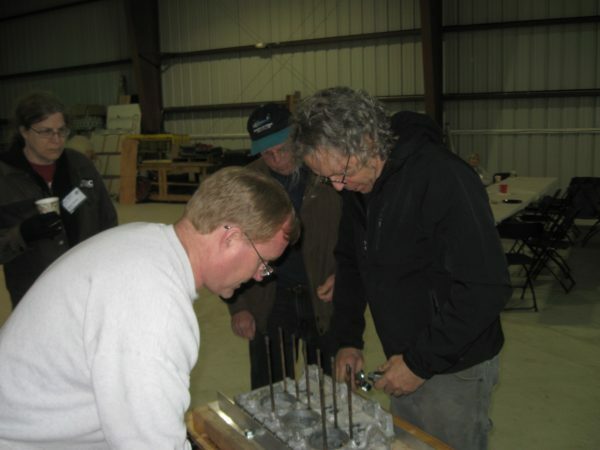 The barbecue has always been an excellent place to get to know other people who are fans of the same engine you are, and in many cases building the same airframe. Many of the best memories I have of Sun N Fun took place at barbecues in the campground. Don’t miss this year’s cookout. With a few days before the event, I feel particularly optimistic about Sun N Fun. As many people know, the event has had a significant change in management in the past year. The new president is a serious aviator, and represents a powerful new force to reorganize the old institution. One man does not correct all the flaws of a 38-year-old giant air show in six months of work. But it is fair to say that John Leenhouts has put a titanic effort into redirecting the focus of Sun N Fun to making sure that every person attending gets the best experience possible. It may take two or even three years before most of his ideas can be put into noticeable effect, and he will always have to contend with TSA required security measures that make every airport seem less friendly. But we have great hopes that the air show that we have been a part of for more than two decades will have real and permanent improvements under his leadership. 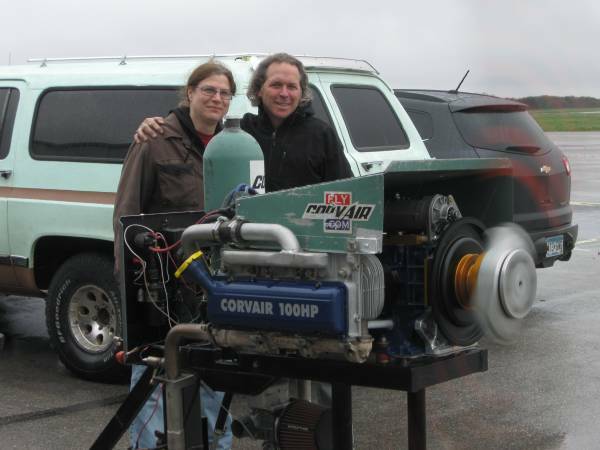 Above, Grace, John Franklin and his new running 2700 cc Corvair powerplant. 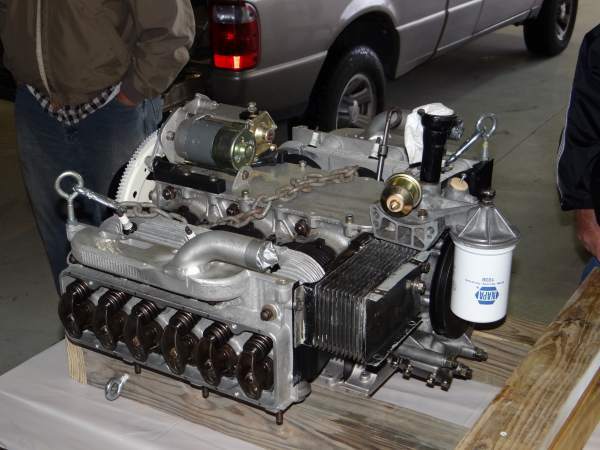 John worked on this engine at Corvair College #21, and finished it at CC #22. It is a smooth running powerplant that features a simple stock oil system and no fifth bearing. This is a good example of the baseline economical powerplant headed to a Pietenpol. If John chooses, he may later upgrade to a Weseman bearing or any of our Gold System Parts without a major rework on the engine. This engine has a nice set of Falcon heads on it and a first-class nitrided crankshaft. 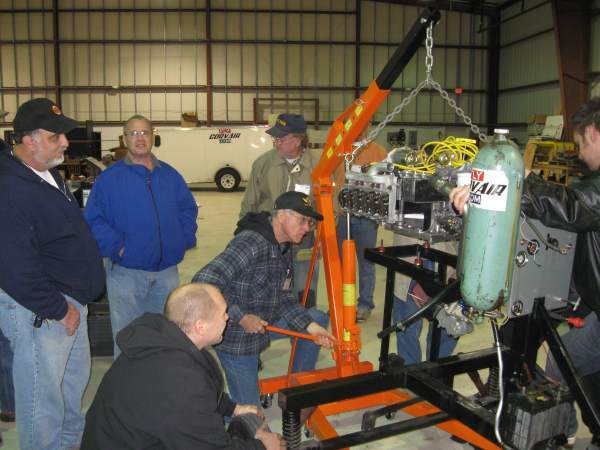 Above, Kevin Purtee, Guy Bowen and Greg Crouchley surround John’s engine after it is placed on the run stand. We primed the engine with an electric drill for a long time with the valve covers off to make sure that the lifters all flowed oil before we ran the engine. Because it was cold, one of the lifters was very reluctant to flow oil. After the test run, we brought the engine back inside, cracked open the valve cover, and confirmed that warming the oil and the test run had gotten the system to flow plenty of oil. When you build up the engine yourself, you have the confidence to look into things like this and verify that it is to your satisfaction. Building a Corvair is about building your own skills and getting away from being beholden to mechanics, engine distributors and importers. Real freedom is knowing that you can count on yourself. 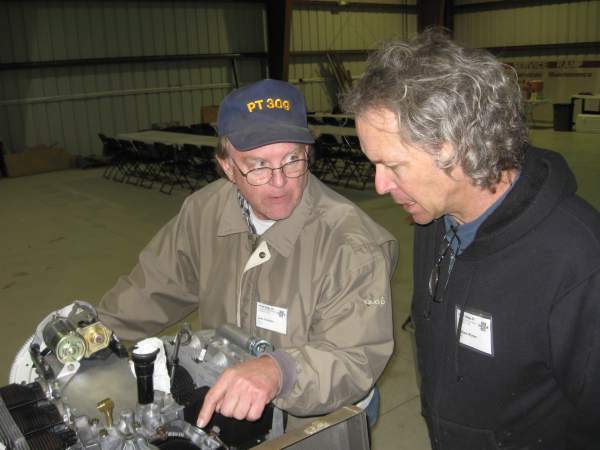 Above, John and I check the oil flow on the engine. During the assembly phase we went over a number of details, including instrumentation. While we do have some very high-end showpieces at the Colleges, the events are still largely about rank-and-file builders building powerplants that will serve their individual needs. I always encourage people to build the best powerplant they can afford, but the Colleges are about educating people to judiciously apply the money in their budget to get the maximum effect for it. At Colleges, you will have plenty of help for any task at hand. This was the real spirit that all aviation events were supposed to have but many are sadly lacking. 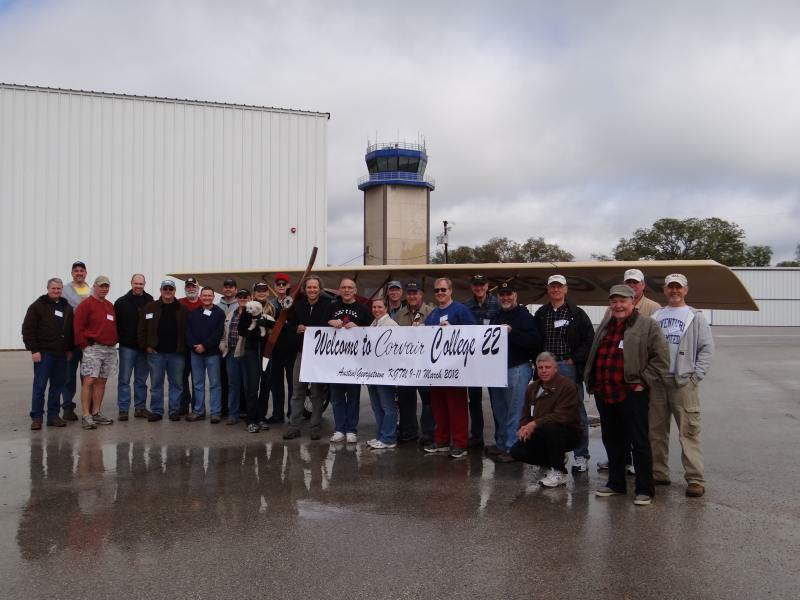 I can’t fix the rest of the world, but Corvair College will always have the spirit of camaraderie and friendship between aviators that has always been a central part of good aviation events. John’s engine ran after dinner on Saturday night, and he had many fellow builders to cheer on his achievement. It was chilly and wet out, but John didn’t seem to mind at all. A milestone event in the building experience: Your engine runs for the first time. John shares a few words over the sound of the powerplant with Grace. Above, John’s engine, a good example of a baseline Corvair powerplant. Notice its stock oil system, including a 12-plate cooler. Internally, however, this engine is built of first-class components. If John chooses later upgrades, he will not have to do anything internal to the engine as the upgrades will bolt on externally. He made some good choices about quality components internally where it would be difficult to go back and upgrade, while leaving open the possibility of a Weseman bearing or further evolved oil system. A Corvair engine like the one above has approximately $4000 in parts in it. There will always be people who would rather buy a C-85 without logs out of the flymart for the same kind of money no matter how many times I point out that a quality C-85 does not need to be dragged all the way to Oshkosh to be sold for $5000 (only the bad ones have to be transported that far and sold anonymously), some people will still try to get away with such an alleged bargain. That’s their choice; they aren’t in experimental aviation to learn things, they’re here to try to get away with stuff. Conversely, a guy like John has put in some real work, learned a whole lot of stuff, and has an engine that is internally new and well proven for the task ahead of it. It also comes with all of our support and the camaraderie of Colleges. Not everyone values such things, but for those who do, we have plenty more Colleges lined up and I will be in this for as long as I live. After verifying the oil flow in John’s engine, we took it back out and ran it again just for the heck of it. It sounded great, and he was very proud of building it, as well he should be. Above is a look at Becky Shipman’s engine before I finished the assembly. Notice that the fins extend all the way around the head studs. These are 1960 Corvair cylinders machined 1/16 inch over bore. This makes them standard bore for a 1961 to ’69 Corvair. After carefully machining a notch in the bottom of the cylinders, it is possible to mate them to a set of 1964 heads and a long stroke crankshaft. 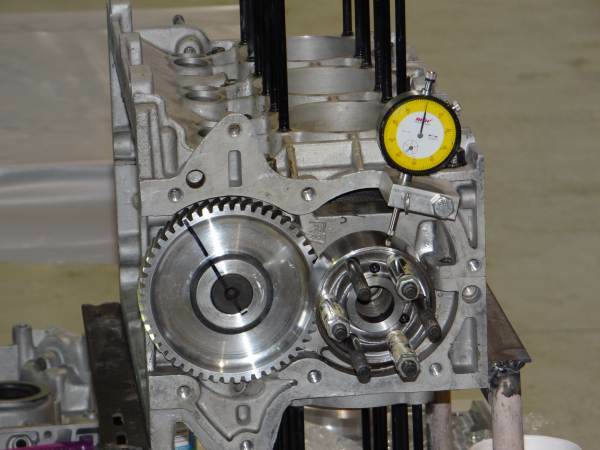 This combination produces one of the lightest Corvair engines without resorting to unreliable or unproven components. Although these cylinders have more fins on them than standard 1964-69 cylinders, the fins themselves are thinner in cross-section and the cylinders are lighter. 1964 heads are about 1 1/2 pounds lighter each than ’66 and later heads. A number of small details like this when watched closely add up to an engine that is approximately 10 pounds lighter than typical Corvair powerplants. The cylinder heads on this engine were prepped for me by Falcon. A close look shows that the pistons in the engine are Sealed Power products with coated skirts. This particular set was made in the U.S.A. before production was corporately outsourced to India. Connecting rod bolts in the engine are ARP. The valves on the engine are one piece stainless with rotators on the exhausts. Above is a view of the engine complete with its Gold System Components installed and prepped for a test run. I broke in the engine for approximately an hour before we brought it to the College for a further run and delivery to Becky Shipman. This view shows how thin 1960 fins are by looking at the upper stud on the number five cylinder. This engine is equipped with a Weseman bearing fed by the silver braided oil line leading directly from the Gold Oil Filter Housing to the bearing behind the Ring Gear. It has the inboard section of its front Alternator Bracket installed, the gold corner of which is just barely visible. I rarely install a charging system on an engine while we are doing the break-in on the engine stand, but it is far easier to install the inboard bracket before the ring gear and the Prop Hub are in place. Above, I stand with Becky and her running engine at the College in Texas. 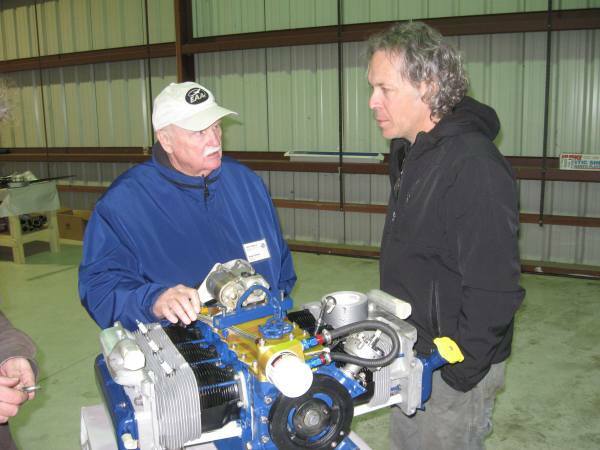 The engine is destined to be installed in her Zenith 650 airframe. Becky drove all the way down from Minnesota to attend the College and pick up as much technical information as possible as well as bring the engine home. Her teenage son Kyle also came down from Minnesota. He proved to be a very sharp student himself and has plans to attend the Air Force Academy. Becky is an Ivy League trained PhD engineer who works in manufacturing for 3M company. She has a good mechanical background and a significant amount of flight experience. I am always glad to work with any builder who shows a genuine interest in learning about the engine they will be operating. Another view of the engine during an extended run on Saturday. 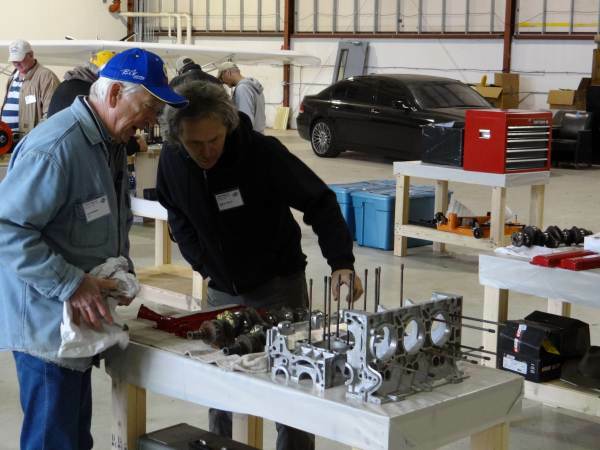 After the run, the engine was brought inside, allowed to cool off and removed from the test stand so that John Franklin’s engine could be run next. At Colleges, there’s always a lot of helping hands for any task to be taken care of. Above is another view of the same engine running in our yard in Florida. The test stand is chained down to a giant concrete block in the ground. Our neighbor Wayne, an aviator of long experience, stands next to me and enjoys the smooth sound of Corvair power.Wayneis six months away from 80 years of age, yet he is an active IA, and flies his Wittman Tailwind and RV-7 every chance he gets. I have heard many men 20 years younger than Wayne talk about not going after their dreams in aviation because they felt too old. Probably something of a self-fulfilling prophecy. Wayne never goes for such negative thinking. He constantly is working to enjoy the day at hand. Anyone attributing Wayne’s energy and longevity to clean living would do well to look closely and notice the beer can in his hand. He grew up on a rural farm in South Carolina that did not have running water, went on to raise several children as a single parent, served in the military and later as a Fire Chief in Jacksonville, has owned, built and flown a wide variety of aircraft. The common thread through his entire life experience is his outstanding positive attitude. About two thirds of the attendees of Corvair College #22 March 9-11, 2012, gather in front of host Kevin Purtee’s Pietenpol. Kneeling in the front row is Gary Boothe of California who was attending his fifth Corvair College. 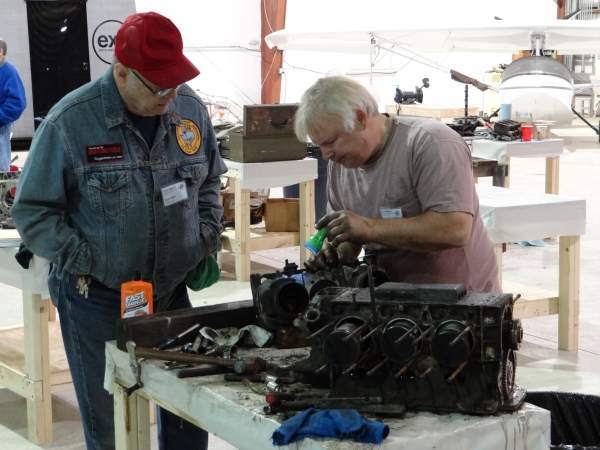 Gary’s Piet is almost done and his engine ran at Corvair College 18, yet he comes back for more because the spirit and the camaraderie of the events are contagious in a modern era of aviation where a real spirit of community is often difficult to find. Our illustrious host Kevin Purtee, above. 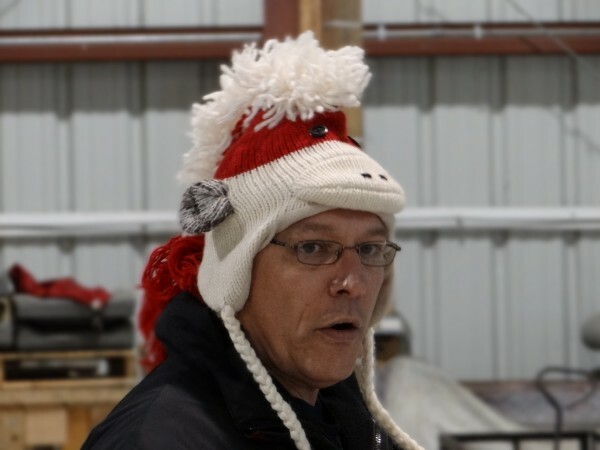 Kevin lives two lives in aviation: His day job is piloting an Apache helicopter and his passion is his Pietenpol and his part in that community. 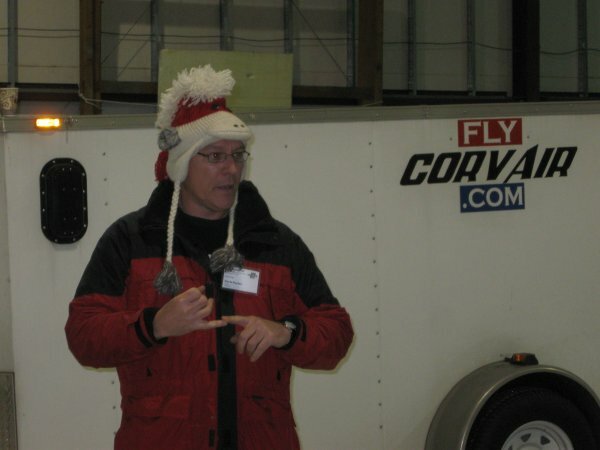 Symbolic of his wearing two hats in aviation is the fact he’s wearing a sock monkey knit hat while making a serious point on his introduction speech. The weather for the first two days of the event was cold and rainy, but this just kept people inside where work continued unabated. Other than being on the chilly side in the hangar, the setting of the event was outstanding. 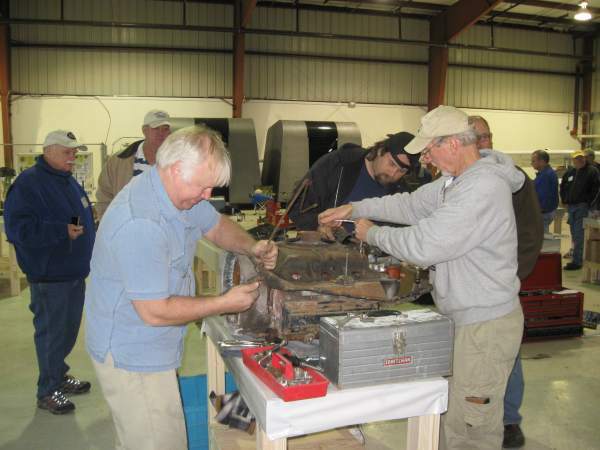 Above, Kevin has taken the cowling off his Pietenpol and gives fellow builders a tour of his engine compartment. His engine is a 2700 cc Corvair with a Weseman bearing fed by a Stromberg carburetor. It has one of our front electric starters and a gold oil system. 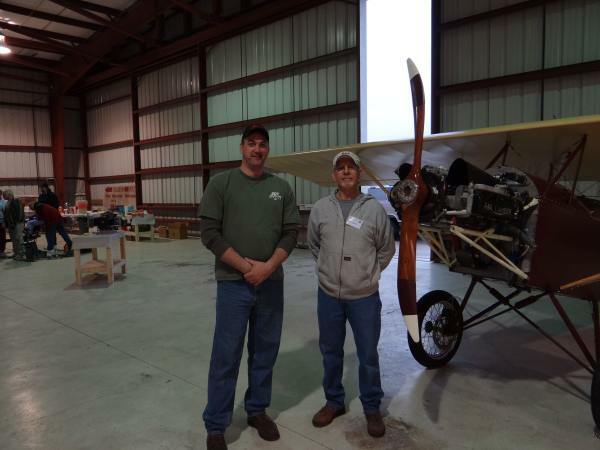 Kevin is one of the people who gets everything out of aviation by immersing himself in it: He pointed out that he plans built his airframe, built his engine himself, and has flown it to Oshkosh twice. 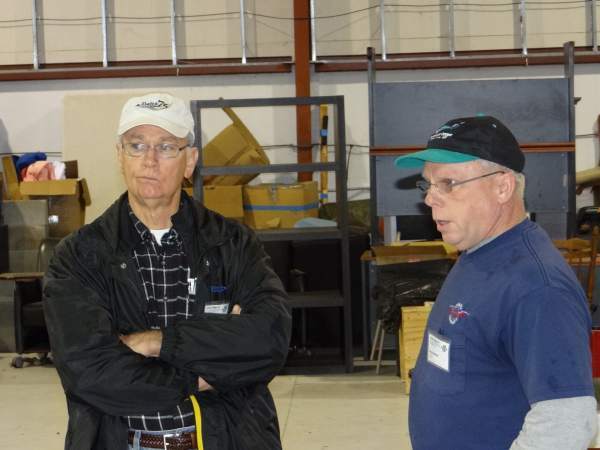 Hosting a Corvair College is an additional facet of an aviator who works to put back as much as he’s gotten out of flying. In the gray coat in front of the prop is Kevin’s wife Shelley Tumino; she is a very effective organizer putting most of the behind-the-scenes work into the College. They have been married only two years. Their family photo album includes lots of pictures of Shelley covering the Pietenpol’s wings. Shelley is an illustrious self-described “East Texas Girl” and is also in the U.S. Armed Forces. A major part of what Shelley accomplished was keeping everyone fed and on scene during the entire event. A lot of detail work went into making sure that builders could remain focused while not starving to death. 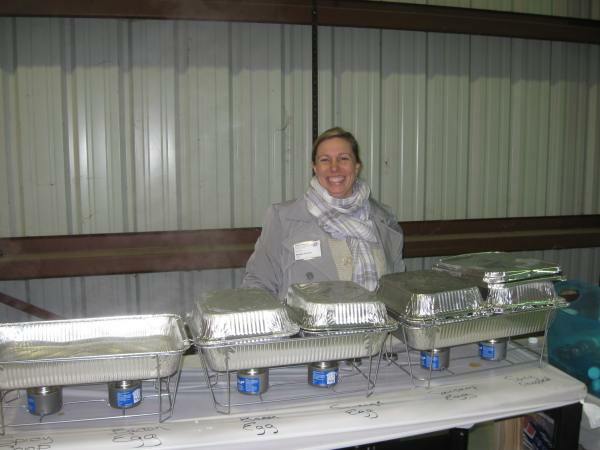 Above, Shelley with a big smile in front of some of the catered food that was continuously on hand for the event. 100% of the fees that we charge during registration go directly to the host to allow them to apply it to expenses directly related to the College. All the work at the College is done by volunteers, and none of them make money off an event. People outside the Corvair community are often surprised at this and somewhat incredulous. I have good reason to boast that the Corvair movement and the people involved are very special amongst modern-day aviation. Kevin and Shelley keep a busy schedule. For example, the week before the College they were having dinner at the White House. 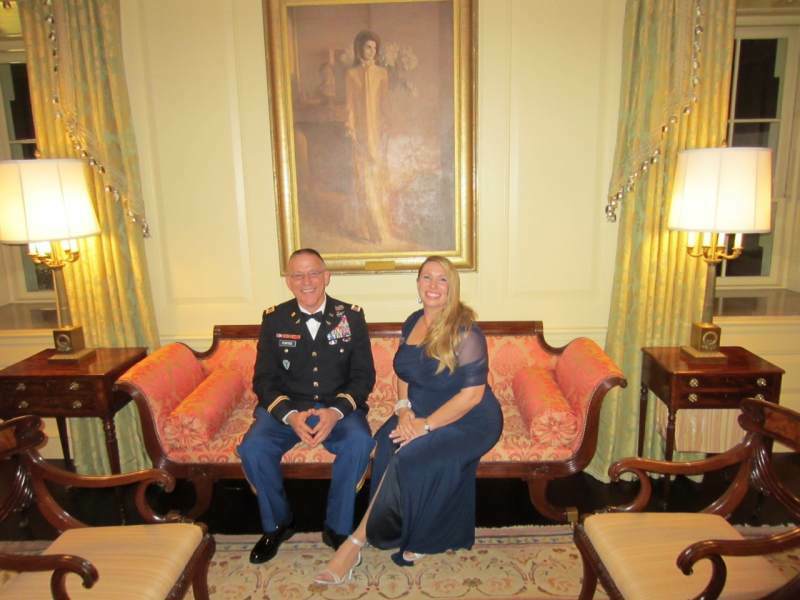 Above, they sit in front of a portrait of First Lady Jacqueline Kennedy in the Vermeil Room. The event was to honor Iraq war veterans. Kevin was chosen to represent the State of Texas at the dinner. While his accomplishments in experimental aviation are a standout, it means a lot more when you consider that he spent most of the past eight years deployed. Above is our foldout display table that we use at airshows and Colleges. People attending their first College often ask if we will be bringing parts for sale. The answer is that I am always bringing parts for sale wherever I am going to whatever extent the method of travel allows. At airshows and Colleges east of the Rockies, this means parts by the truck and trailer load. In years past, we were frequently backordered on a number of items, but this has long since changed and we literally brought more than 1,500 pounds of engine and installation components for sale. The Colleges are focused on learning and camaraderie, but it is important to have readily available hardware for builders. Grace and Scoob E decided that they had so much fun at Corvair College #21 that they were definitely going to CC #22. Colleges are a lot of work and to stay in shape they have both taken up bicycling. 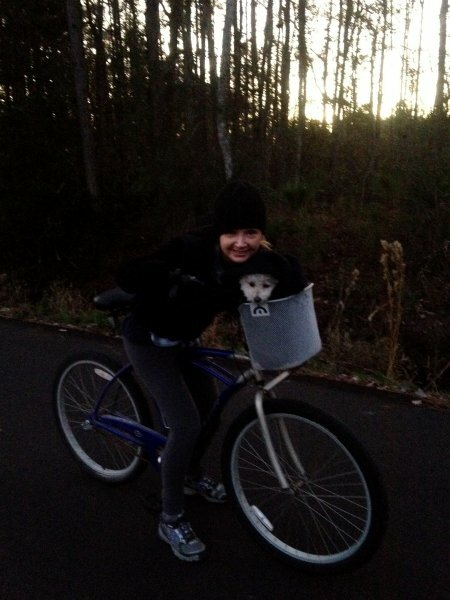 Here on a chilly evening in Florida, the two of them log a few laps around our airpark. When you only weigh 9 pounds, you don’t have a lot of spare insulation. 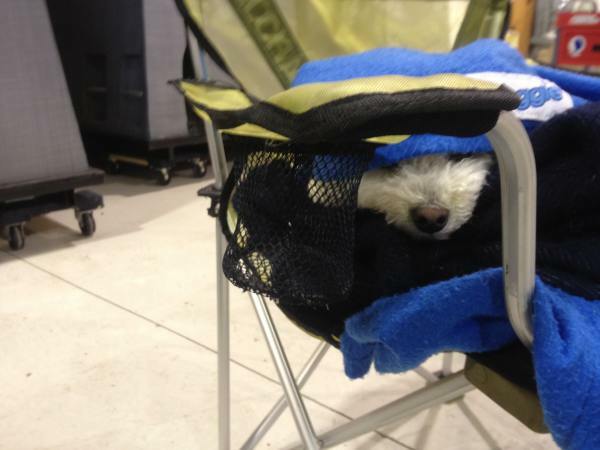 When it got good and chilly, Scoob E enjoyed a pile of blankets on his chair at the College. The windy bicycle training at home had toughened him up. 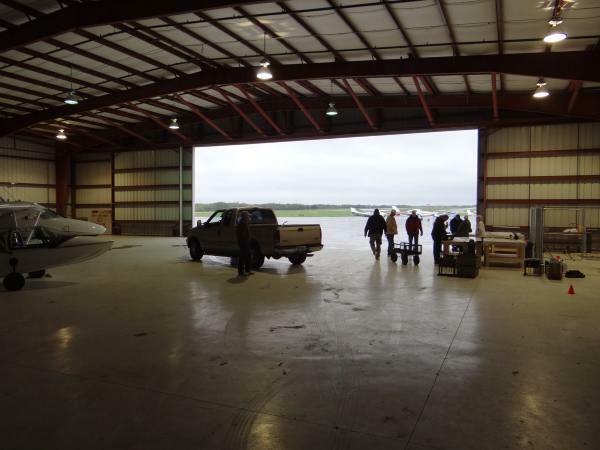 This one photo gives a good idea of the size of the hangar that Shelley secured for the event. This photo was taken just after the corporate jet was rolled outside into the rain to make way for something really important in aviation. The hangar was clean and well lit and roughly 100’x100’ in size. 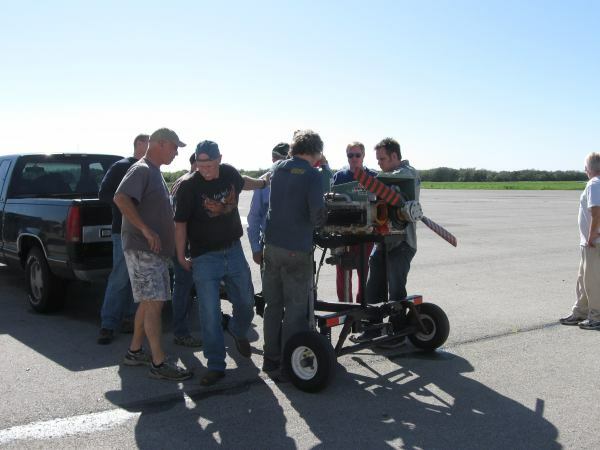 Above, Kevin and I talk policy by the tail of his Pietenpol, while Greg Crouchley from Rhode Island eyeballs an engine on the test stand in the background. To keep it out of the rain but demonstrate it, Kevin ran his Pietenpol in the hangar after carefully tying down the tail to a truck and chocking the wheels securely. A handful of builders present had never seen a running Corvair before and were duly impressed with the smoothness and the ease that it started with on a 45° day. Many of the photos used in these updates were provided by Pietenpol builder Mark Chouinard of Oklahoma, at left above, to whom we extend our grateful appreciation. Standing next to him is Robert Caldwell, who ran his engine on his birthday at Corvair College 21. He is also a Pietenpol builder. It may be a little hard to scale from the photo, but Kevin’s Pietenpol sits up higher than almost any other one I have seen. Mark is a friendly and gentlemanly giant, about 6 foot five. The award for the cleanest case at the College goes to Vic Delgado, in the center above with Grace and I. Vic is building a 3 Liter Corvair with a Weseman bearing. Grace is wearing vintage College jewelry, a necklace I made up of Corvair rod nuts strung on safety wire. The last day of the College brought excellent weather and sunny skys. Kevin took advantage of this to give a number of people their first flight in an open cockpit aircraft and/or their first flight in a Corvair powered aircraft. 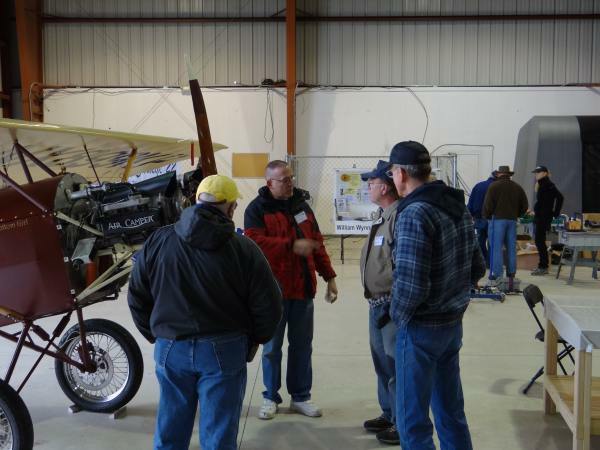 Most of the people on hand were very impressed with the rate of climb available in his aircraft. When you’re a badass like Kevin, any hat you wear is The Hat of Power. When the going gets tough, the tough get going. When the going gets chilly, smart people congregate around the propane heater. 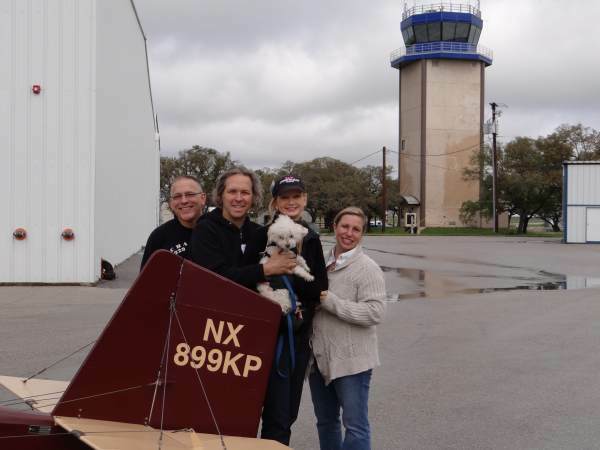 Old school EAA builder Byron Engle sits with Grace and Scoob E and enjoys some BTUs. 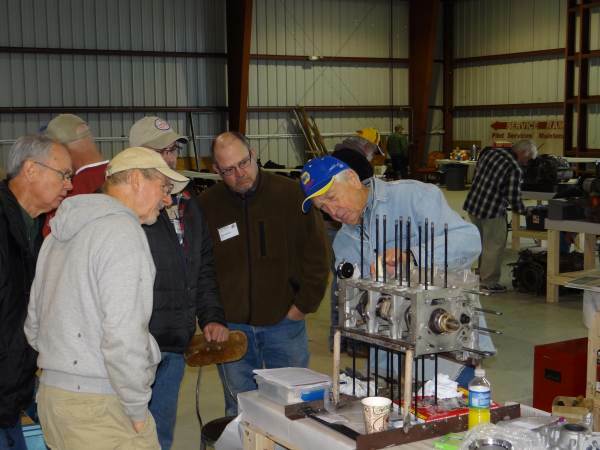 Byron has been in the EAA since 1972 and as an active member has seen all the changes that have happened to the organization. I take it as a great compliment when builders from his era congregate in the Corvair movement. 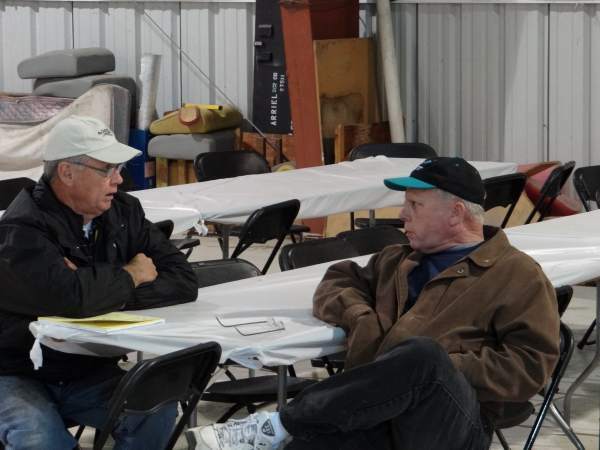 It lets me know that we are seen as one of the faithful who remain focused on the EAA’s original motto of “Learn, Build and Fly.” Byron brought out his photo albums and shared many photographs of his projects over the years. He has a very impressive Turner T-40 in his hangar. 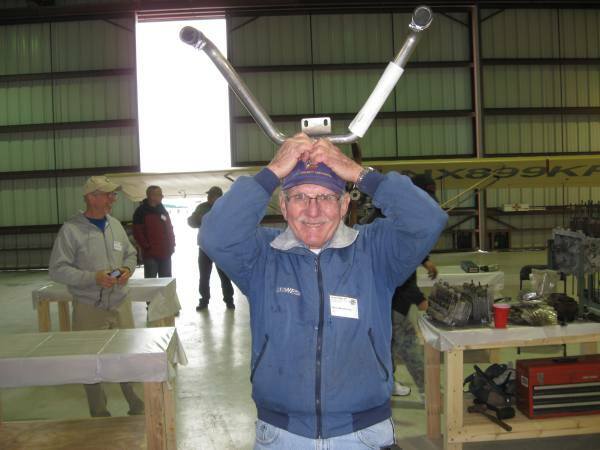 Norm Beauchamp, the first man ever to fly a Corvair in a Kitfox, takes a moment to goof around with an Intake Manifold. Norm is currently reworking his installation, to refine it and bring it back as a state of the art installation. 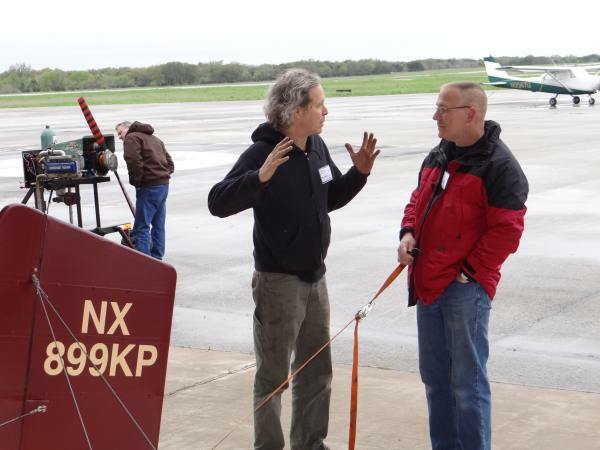 His airframe is a Kitfox Model V.
At the center of this photo is Craig Anderson who drove down with his wife from South Dakota for the College. Craig is now the proud owner and restorer of the Stits Skycoupe that was our testbed 10 years ago. We’re looking at the installation of the Weseman bearing onto Craig’s case. Craig got a Set of 2850 Pistons and Cylinders from us, and a pair of cylinder heads from Falcon Machine. Along with all of our Gold Installation Parts and the existing installation on the Skycoupe airframe, he is well on his way to having the aircraft back airborne by the end of the summer. I look forward to seeing this piece of history, a part of the Corvair movement, flying around to events and Colleges. Above, Byron Engle takes apart a core motor. 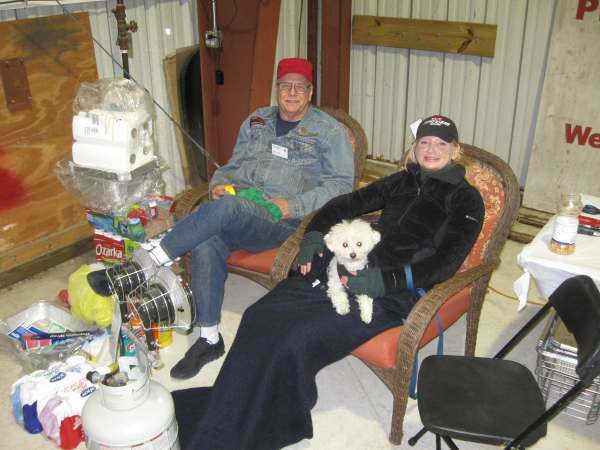 Kevin and Shelley constructed dozens of individual 2′ x 4′ benches for builders to work from. They were extremely sturdy and allowed builders to walk all the way around the engine while it was being constructed. We had previously focused on 4′ x 4′ and 4′ x 8′ benches at the Colleges, but they may have started something new here. Near the end of Corvair College#22, we took a moment for Kevin, myself, Grace, Scoob E and Shelley to have a portrait with the tail of Kevin’s aircraft. It was a very satisfying event, and well worth the 2200 miles of driving. Before we packed up and headed home, Kevin and Shelley pointed out that he may very likely be deployed next year again, but they wanted to get it on the schedule right now that they are hosting Corvair College in 2014. We are all looking forward to it. Here are some technical notes from the building at CC #22. 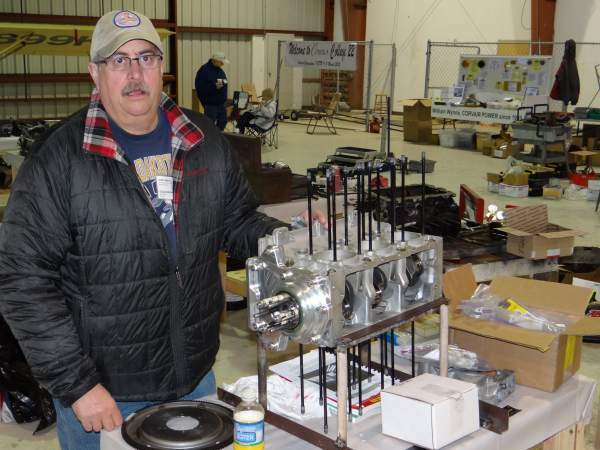 Above, Craig Anderson of South Dakota with his Weseman bearing equipped 2,850 cc Corvair in process. 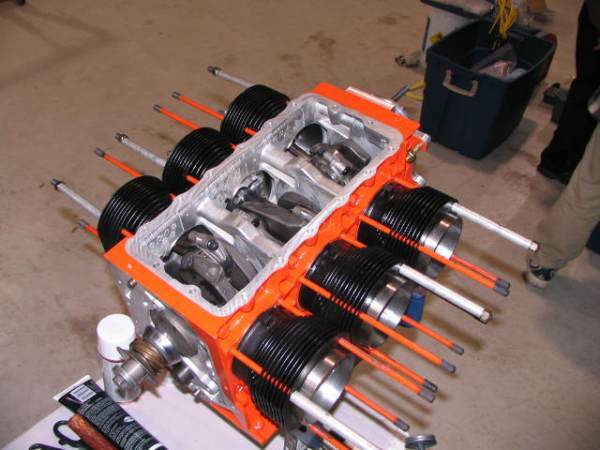 Greg’s engine is built around a Moldex nitrided crankshaft and a pair of Falcon heads. The engine will feature all of our Gold Systems. He installed the Weseman bearing at the College. 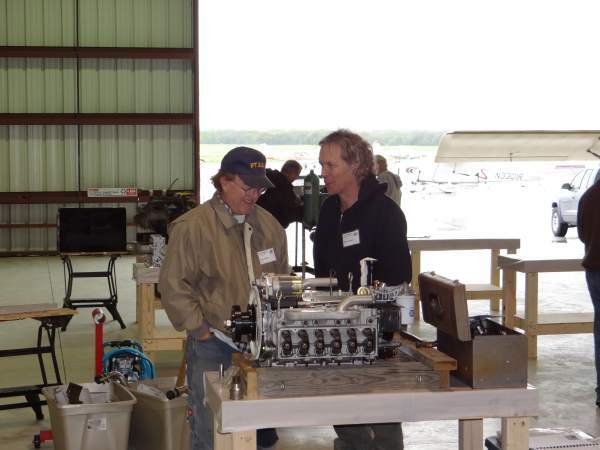 Old school EAA builder Byron Engle, at left above, and David Cain take apart a core engine on one of the 2′ x 4’ tables. 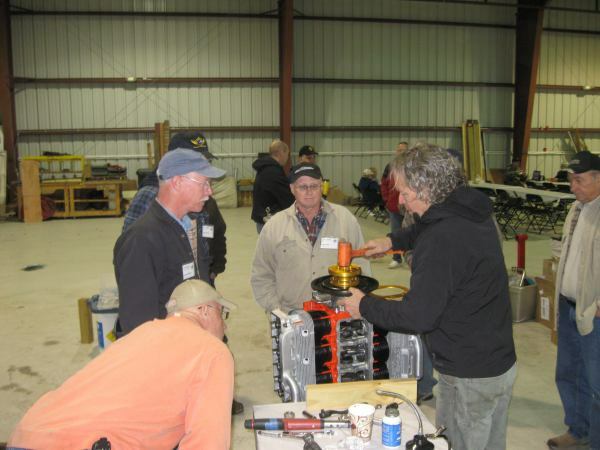 About eight of the builders brought a core motor for disassembly or further inspection. On the right is Gary Boothe, who was attending his fifth Corvair College. He is a Pietenpol builder from California. 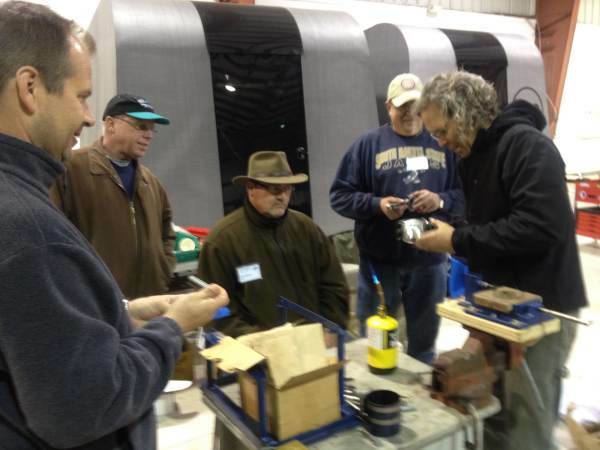 At left is Buddy Linder, Pietenpol builder from Texas. 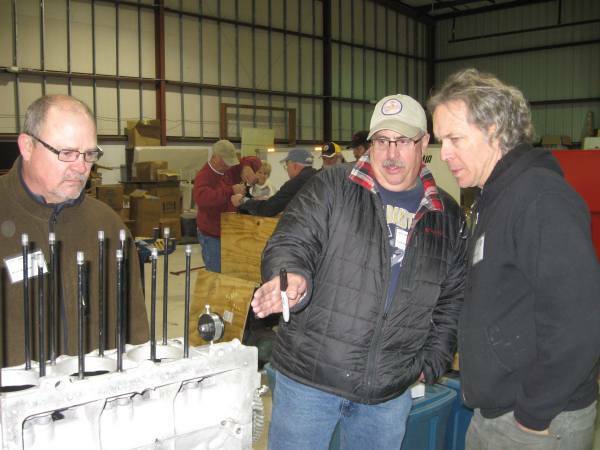 Corvair Colleges are an unprecedented opportunity to exchange ideas and thoughts with other builders. This type of conversation is not really possible online. There is a whole social side to aviation that can only be served by in person events. Above is another one of the Corvair cores that showed up being torn down. Although it was completely filled with leaves in the cooling shroud, it turned out to be a pretty good engine internally. Eric Overton is in the gray sweatshirt. In the photo above we are going over the studs in his case to verify that they’re in good shape. Eric is a highly skilled Ivy League trained electrical engineer who is comfortable developing very high-end electronic systems. At the College he gave a very funny dissertation on America’s addiction to consumer electronics, and his role as a facilitator. 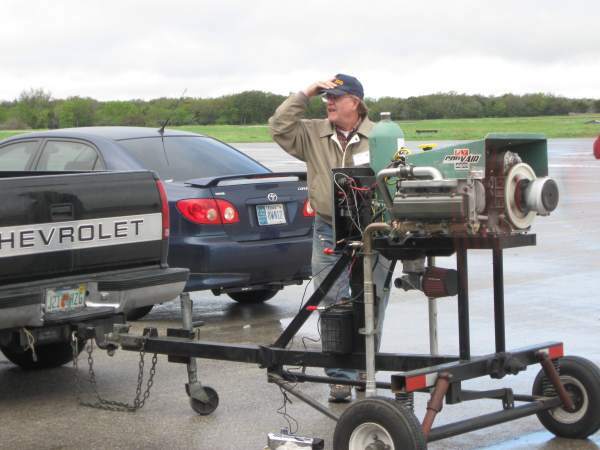 He went on to humorously point out that he drives a 1963 Ford and is building a World War I replica aircraft because everyone knows successful pushers do not use their own addictive products, thus he steers clear of technology in his own life. Above, I speak with Roger Grable, who came to the College with his wife Sarah. 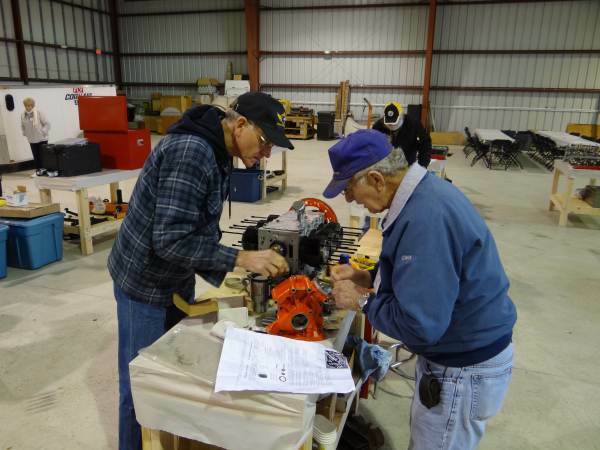 They’re building a Zenith 750 and making great progress on the airframe. Roger elected to purchase a complete 2,850cc engine equipped with a Weseman bearing and all the installation components from us. 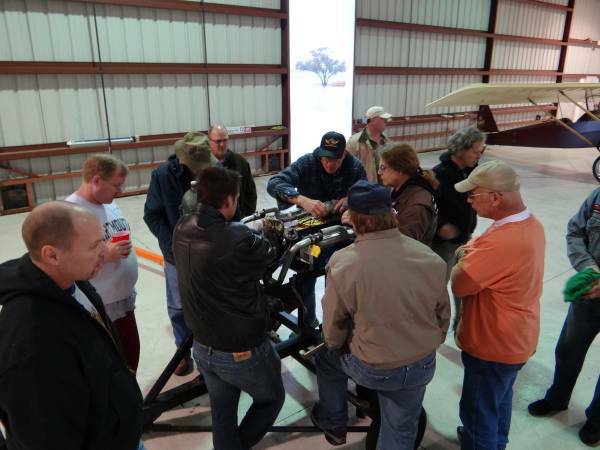 They came to the College to become much more educated about the engine they will be installing and operating on their aircraft. 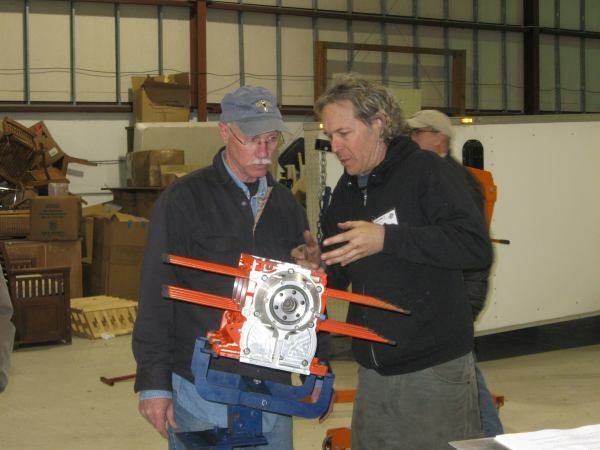 We personally produce about 15 engines in a busy year. Because they are a good value, we have never had any trouble selling every one we can make. This reality, and the fact that pre-built engines are not our primary mission, has allowed me to be selective in who we choose to build for. Believe it or not, I frequently get calls from people who will readily confess to not being interested in learning anything about engines, to the extent of being unwilling to read our Flight Ops Manual. From long experience, I know to politely decline to build engines for such people. Roger represents the polar opposite of this, a builder whose schedule puts a high premium on his time, but yet he is still willing to come to a College and take the time to learn many of the techniques that we have painstakingly developed which allow Corvair pilots to enjoy the engine’s excellent reputation. I am always glad to work with builders who possess Roger’s perspective and values. 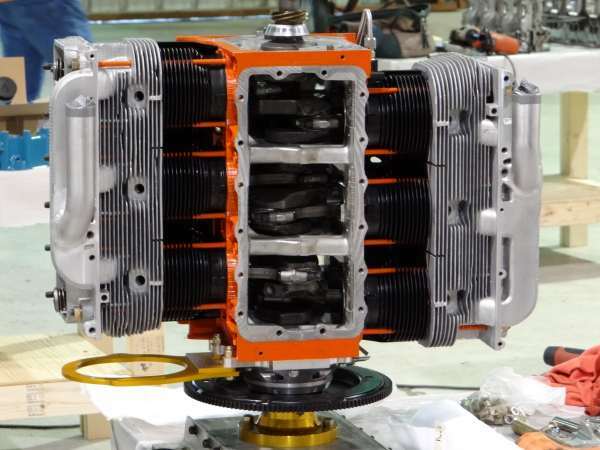 Above, Norm Beauchamp’s 2,700cc Corvair engine destined for installation on his Kitfox Model V. A close look shows that the engine is equipped with Clark’s full fin heavy duty cylinders. The engine also sports a Weseman bearing. This is one of the Weseman’s earlier cast housings. 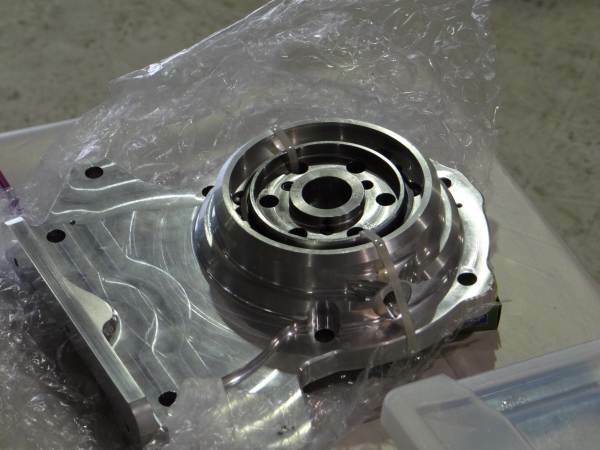 The current series of production are all billet machined housings. The switch to billet housings has allowed Dan to mass-produce the bearing and have them available and on the shelf. 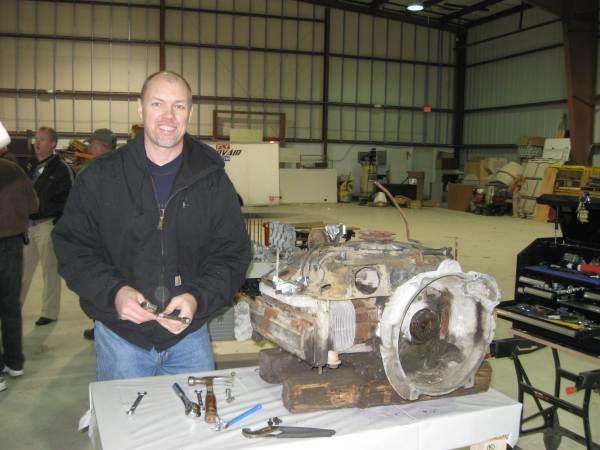 Sonny Webster of Texas with his core engine ready for disassembly. He is building a Zenith 650. 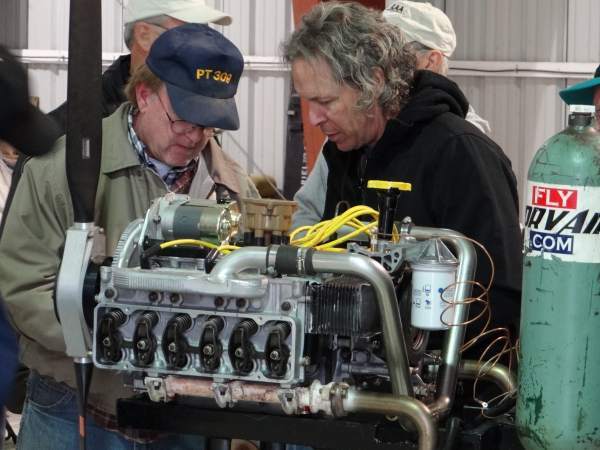 Ken Schmetter, at left above, watches Becky Shipman’s 2,700 cc engine coming off the stand. Becky’s engine is equipped with one of our Welded Aluminum Pans. Also visible is one of our new high-volume oil pumps. The black rubber hose shown in the view is a bypass for the high-volume oil cooler that is not installed yet. On the test stand I want the oil in the engine to come up to temperature fairly quickly. This is done by keeping the oil cooler outside the cooling baffle, or in the case of heavy duty oil coolers just running a hose as a replacement until after the engine is broken in. Corvair engines take a long time to develop high oil temperature on the test stand with cool air washing over all parts of the engine. During the initial break-in, there are a number of good reasons to have the oil temperature come up quickly. Above, Brian Manlove, Zenith 650 builder from Texas, gives me a hand warming up connecting rods to be installed on 2,850 cc pistons. The gas we are using is map gas which burns a little bit hotter than propane. Visible on the right is my plastic jawed jig for holding 2850 pistons while the rods are installed. The small upright holds an adjustable stop that keeps the wristpin from traveling too far over during the installation. 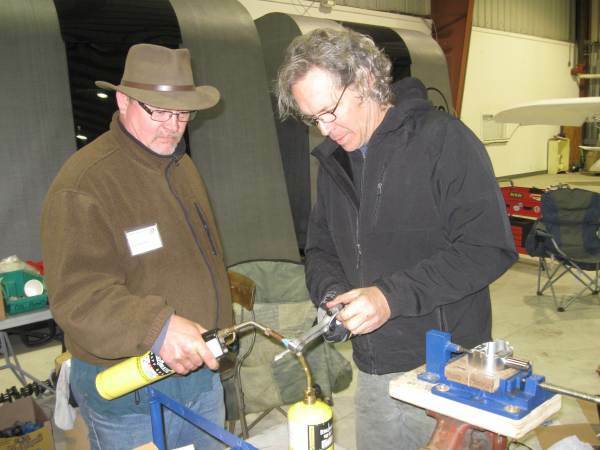 When the small end of the rod is heated to 400 Fahrenheit, you have about 2 seconds to install the wristpin before it becomes held fast in the connecting rod. 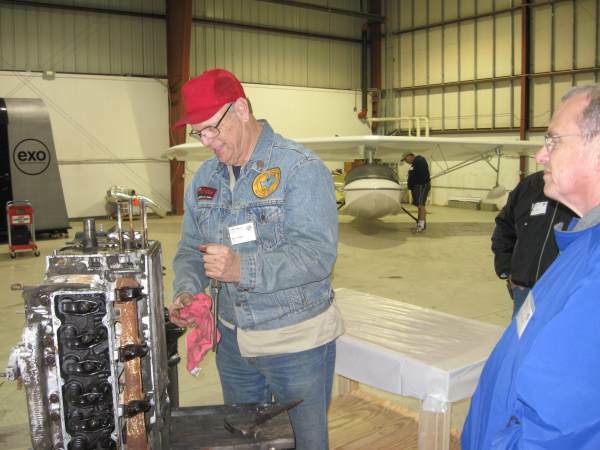 Above, Norm Beauchamp works on his engine with Ken Schmetter. 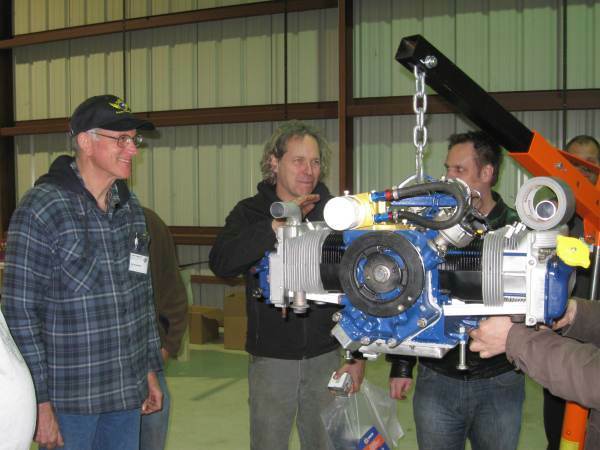 In the photo, Norm is carefully going over the installation of a Clark’s high-volume oil pump. High-volume oil pumps are recommended on all engines that utilize Weseman bearings. The Clark’s pump comes complete with instructions on how to assemble it but it does take some trial and error to get it to set up smoothly. The above photo is of a Weseman bearing coming out of its packaging. This is one of the new billet housings. Dan and his family have produced approximately 250 bearings, of which the last 50 or so have been billet units. The majority of these bearings are now on completed and running engines and dozens of them are out flying and logging lots of hours. The high time unit has now exceeded 400 hours. The bearing is retrofittable to a completely assembled engine, and it is affordably priced at $1050. The unit is completely compatible with all of our Gold System Parts. Going to a billet housing allowed Dan to shorten the manufacturing process from several facilities to one with a follow-on quality control check. This has gone a long way to allowing Dan to keep these bearings in stock and on the shelf available whenever builders need them. Above, I carefully go over crankshafts with Jon Sanders. Jon had two different crankshafts on hand, both with new gears. Careful inspection revealed that one of the crankshafts was standard and was factory nitrided. This crankshaft can go directly into an engine after it has been threaded for a Safety Shaft. It does not need to be re-nitrided unless it is ground undersize. 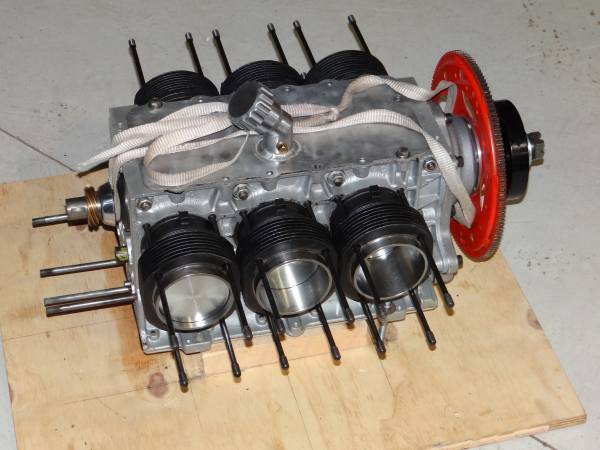 Jon’s plan is to build a 2,700 cc engine with a Weseman bearing and install it on his KR-2S. From left above, Kendall Darder ready with a wrist pin, Gary Boothe, Brian Manlove on torch, Craig Anderson of the Documentation Department and myself installing pistons on rods. I did three sets while we were at the College and gave a number of people a firsthand look at the process. The College is all about builders working together. Above, Jon Sanders lends some exacting assistance to Craig Anderson on the installation of the Weseman bearing on Craig’s 2850. Weseman bearings have a complementary installation kit that is available from Dan’s family. The price of the kit is refunded upon its return to the Wesemans. Above, the dial indicator shows that the steel crankshaft hub that the Weseman bearing rides on is correctly installed. Barely visible are the three small Allen screws that are centered around the crank nub. By adjusting these screws and the tapered shims underneath them carefully, the steel crank hub can be zeroed to exact alignment with the crankshaft. The engine in the picture is Craig Anderson’s. The camshaft gear is a billet failsafe model from Clark’s. This core looked absolutely terrible on the outside, but inside was hiding a viable engine. 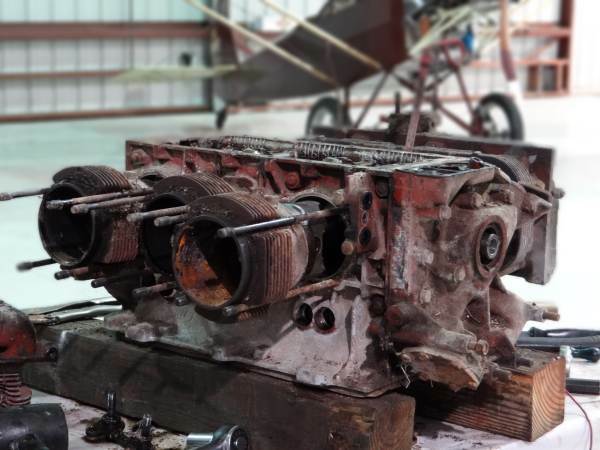 At first glance it does not look ready to actually be considered for rehabilitation into an aircraft powerplant, but first glances can be deceiving. Look closely and see that all the head studs are in excellent condition. Although I’m not a big fan of engines that have had water down in the bores like this one has, my major objection is based on the idea that they are more difficult to take apart than a core that rotates. 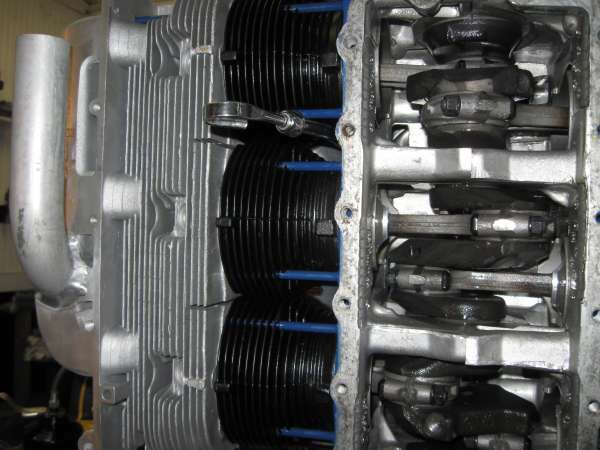 An engine like this must have the valve seats carefully inspected because engines that had water in the combustion chamber for any length of time may have serious dissimilar metal corrosion between the seats and the aluminum cylinder heads. 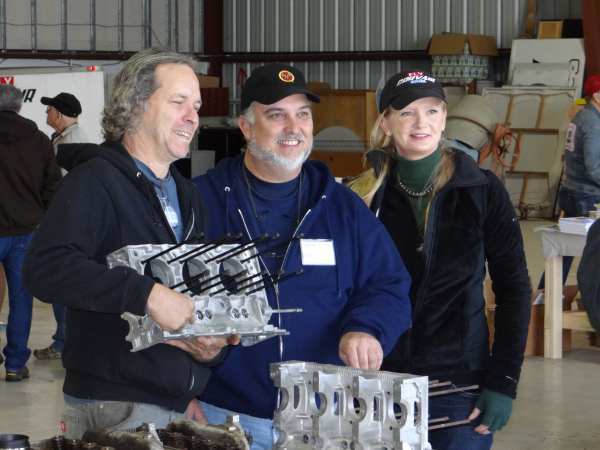 If you have a cylinder head that has had water in it, I would be very reluctant to utilize it on an airplane unless I sent it to Mark at Falcon and allowed him to completely reconditioned the head. If you’re planning on using the heads from your core motor with just a basic valve job, you need to have excellent condition heads to work with, not ones from a core like this. It seems counterintuitive but the most budget-minded engine build often starts with the most expensive core motor available. Conversely, expensive rebuilds can be done from any core because every single part including the valve seats themselves will be replaced in process. More Running Engines coming in next posts.